Ok, sounds simple right? Well, there are a gazillion tools in piZap, we didn’t want you to get confused. 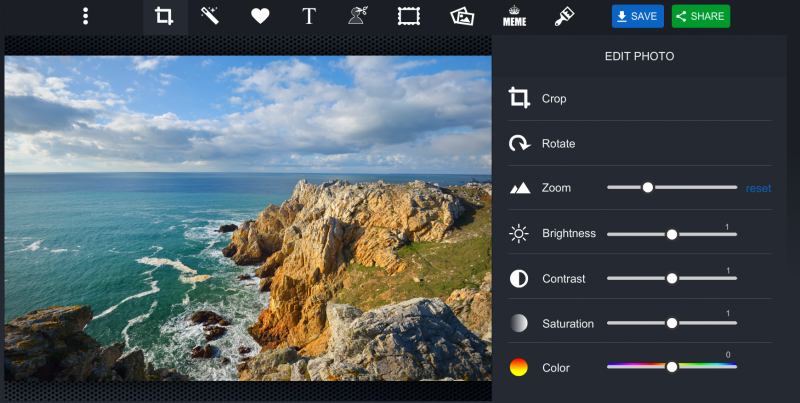 To make the best photo possible BEFORE using those other great tools, we recommend you edit what you’ve got first. Our colorful buttons make it easy to find. Here is where it gets fun. It doesn’t really matter where your original photo is housed, because our software makes it super simple to pull from just about anywhere it could be, whether it’s on your desktop, in the cloud or on a social media channel! Crop – the Crop tool allows you to cut off the things in the image that you do not want, or to simply focus on one element of the image. To use this feature, simply click the Crop button and an adjustable frame will pop up. Choose the area of the image you want to keep, click Crop and the rest will go way. Just like that. Rotate – Did you upload your image in wrong direction? No problem, select Rotate to get it back to where it belongs. 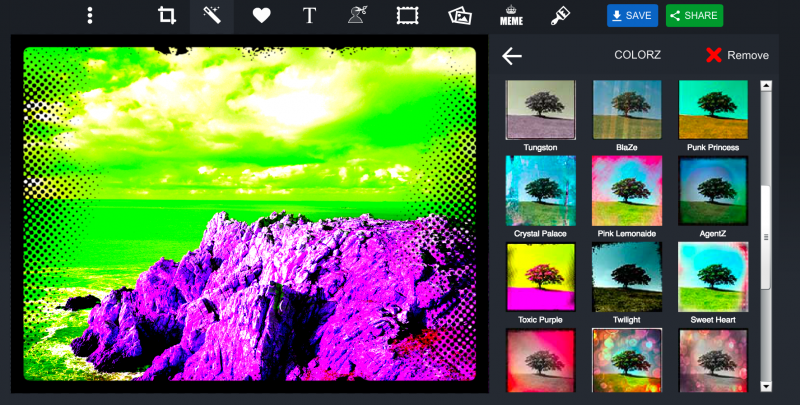 OR, for all you creative types out there, use this feature to show off your artistic side (you know who you are). Zoom – Zoom is actually quite similar to Crop, except that the focal point you’ll zoom into is the center of the image rather than what you choose to focus on. Make sense? 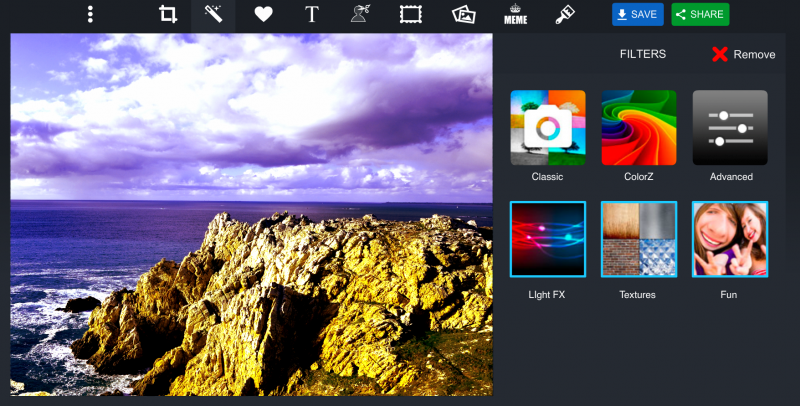 Brightness – This tool will help make your image pop by bringing lightness in. 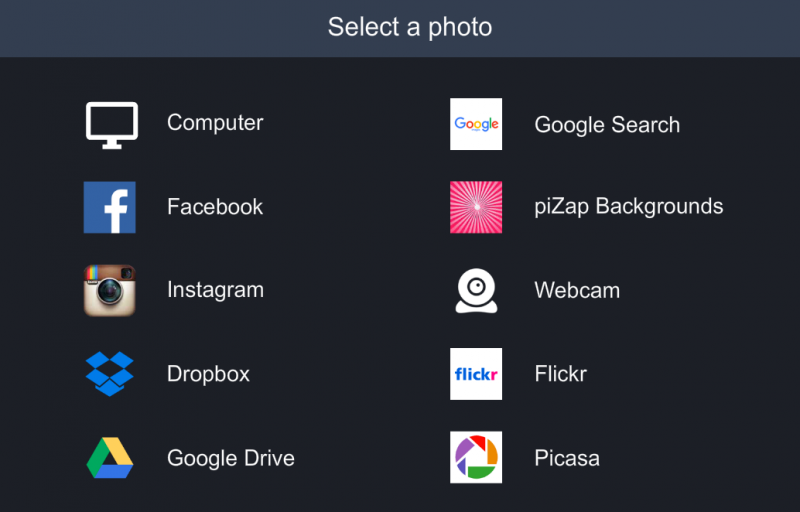 This is especially helpful for those under exposed images. No need to go overboard, use the slider to choose exactly how bright you want to go. 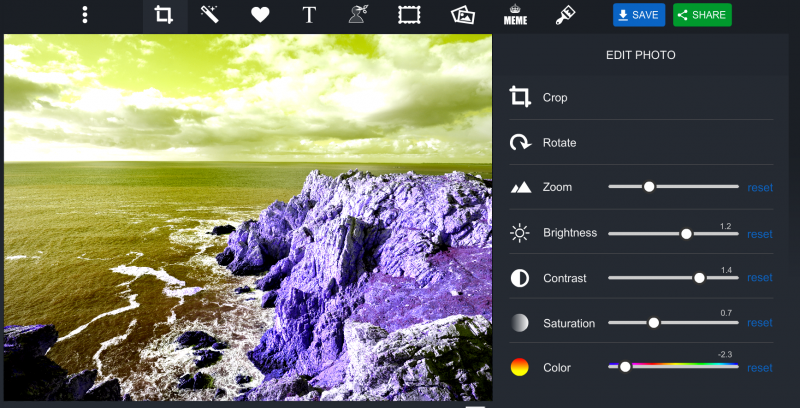 Contrast – You can add depth to your images with the Contrast tool. Sliding up or down will add to – or take away – the shadows and will surely add drama to your picture. Saturation – Whereas the Contrast tool brought out the shadows, the Saturation tool brings out the color of your image. It will “saturate” with the native colors when you adjust up, or take out the colors when you adjust down (making for a cool black and white effect). Color – This tool helps you to adjust the color within the image. Too green? No problem, use the Color slider to add more red. Want to create a cool artistic look? Adjust the slider. In addition to the manual manipulation of images, we also offer the easy-breezy Filters to help with an even more specialized look. Go Classic with filters to give your picture a vintage feel, or a soft border. Choose ColorZ for a pop art look or for a colorful border. Choose Light FX to add a whimsical look of hearts, light streaks or under water. Add Textures to for a unique overlay. Pick Fun for a Kaleidoscope, blurry or pixelated look. Once you have edited your image to perfection, now you can go check out some of the other cool tools of piZap! Previous Post6 Last Minute Mother’s Day Gift Ideas She’ll AdoreNext PostIntroducing – Emoji Crack!